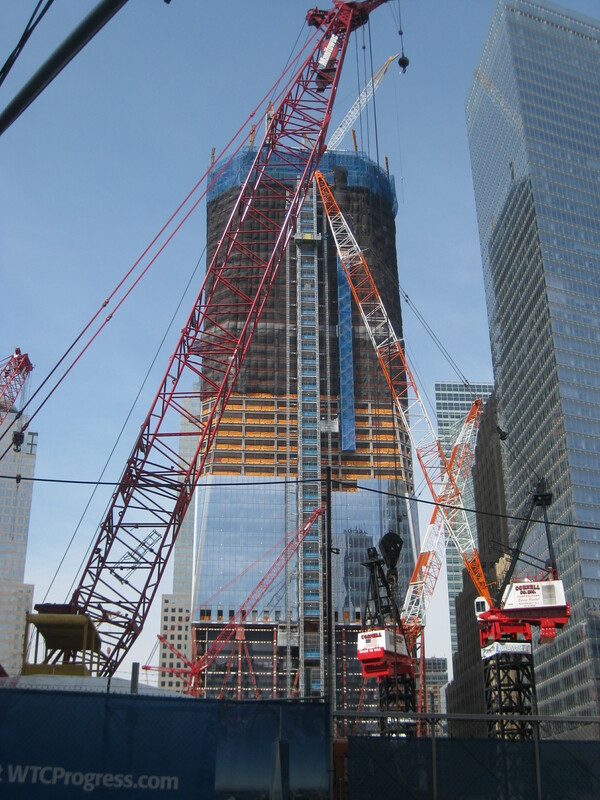 In mid-March 2011, I traveled to Lower Manhattan for work purposes and decided to walk over to Ground Zero during my lunch break. I had last visited the former site of the Twin Towers in 2004; when the “Freedom Tower” design had recently been unveiled, but clean up was still underway. As I walked down Vessey Street with St. Paul’s Chapel on my left, I stopped in my tracks and reached for my camera. The construction of the “Freedom Tower”, known officially as One World Trade Center, was already reaching into the heavens at approximately 700 feet with 58 stories completed and the beginnings of the building’s glass curtain starting to take shape. Though far from the planned 105 stories, I already sensed the city’s proud buzz over the tower’s progress, an already but not yet phoenix rising from the ashes of 9/11. The new structure, even unfinished, radiates attitude and strength. The scene begs and bleeds emotion. I sat down in front of the Millenium Hilton and ate my turkey and cheese watching as history unfolded, contemplating the ascent of the new towers and imagining what the old must have looked like. I walked over to St. Paul’s, erected in 1776, standing less than a hundred yards from Ground Zero. The chapel miraculously remained standing in the midst of the 9/11 attacks. It was on these church fences that the New York City firefighters hung their street shoes before entering the towers, but never returned to them. It was here that first responders organized to provide assistance in recovering victims, before they too would fall ill from inhaling the toxic debris. Inside the church was an exhibit displaying badges from various first responder units. There had representatives from Santa Monica and Los Angeles County, near my location at the time of the attacks. Officers had been present from now familiar Connecticut communities such as Bridgeport and Stratford and units from as far off as Tokyo and Germany. There was a badge from my mother’s hometown in Santa Ana, California and from my paternal grandfather’s childhood home in Lancaster, Pennsylvania. A national tragedy had summoned a global response. From the churchyard, I spotted the 9/11 Memorial Preview site and headed over to gather more information. The gallery boasted a timeline of significant events in regard to the World Trade Center site and digital renderings of the National September 11 Memorial & Museum (NS11MM) and the four structures which will comprise the new World Trade Center. 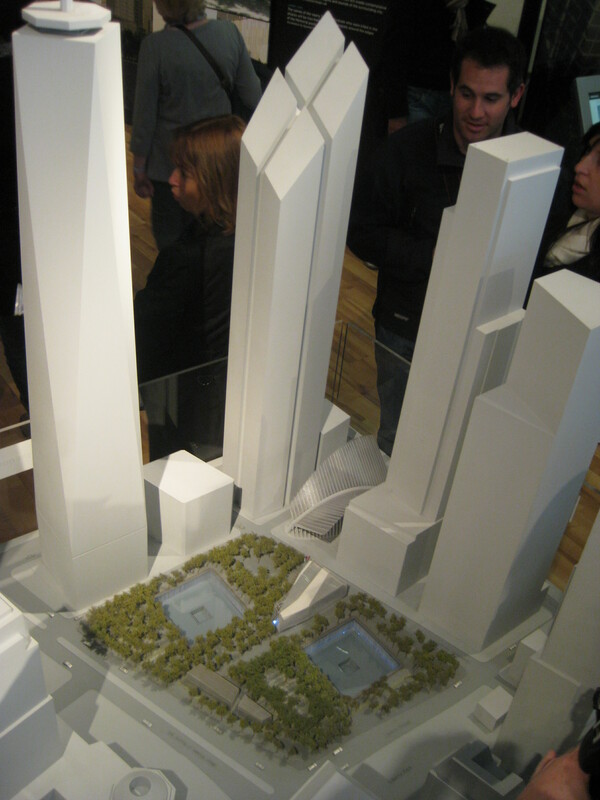 None of the new buildings will be constructed where the Twin Towers stood. The footprints of the Towers are being transformed into large recessed pools with streams of water flowing into an abyss below and the pools are to be surrounded by a continuous ribbon of named victims. I picked up a couple WTC Progress flyers, while an attendant employed at the Preview site confidently announced the NS11MM would be ready to open this September on the 10th anniversary 9/11. The memorial is expected to be the most visited site in America with nearly 1,500 visitors per hour. Passes reportedly will become available for reservation as soon as this July. For any Tower Glass folks who may be reading, get this. Upon completion, One World Trade Center will boast an exterior cladding consisting of over one million square feet of prismatic glass. Over 12,000 glass panels, larger than 5’x13’, will be incorporated. The building was designed so that the “façade panels will form eight tall triangles of glass and steel, which will grow alternately wider and narrower as they approach the top of the building.” The tower’s exterior will “refract light and change its appearance depending on the weather and the viewer’s position.” Heavy. New York is certainly no stranger to pushing architectural limits. The Chrysler Building (1,046 feet) was the tallest freestanding land structure on the globe for two years after it was built in 1930, before its record height was eclipsed by the Empire State Building (1,250 feet) which held the world record for nearly four decades. The original twin towers surpassed both the Chrysler and Empire State buildings with the North Tower standing at 1,368 feet (1,728 feet antenna included) and the South Tower at 1,362 feet. The colloquial Freedom Tower’s spire will stand at a symbolic 1,776 feet making it the tallest building in the Western Hemisphere and the fourth tallest in the world. The Temple, the pride of the people and center of worship, had already been destroyed once in 586 BC by a “terrorist attack” when Jerusalem was sacked by the Babylonians. The Temple was rebuilt in approximately 515 BC after 70 years of captivity and in Jesus’ time was in the midst of a decades long renovation and expansion project under Herod. Some believe the altitude referred to was in the range of 700 feet, the same height as the partially constructed One World Trade Center in the photos I took in mid-March. This Pinnacle is where Jesus was taken by Satan in Matthew Chapter 4 and in the Midrash is reported to be the place the Jewish people believed that Messiah would manifest himself. From other Gospel reports we know Jesus was not anti-Temple, most notably in John 2:13-16, Jesus drives out the money changers from the Temple grounds and rebukes those who are “making my Father’s house a place of business.” Jesus probably had some fond memories of the Temple. Our only glimpse into His childhood (Luke 2:45-50) records that at age 12, Jesus spent three days at the Temple in the midst of its teachers, listening and asking questions. When his clearly upset parents ask him why he had decided of his own accord to stay in Jerusalem unbeknownst to them, he replied, “Did you not know that I had to be in My Father’s house?” The text states that His parents did not understand the statement which He had made to them. It wouldn’t be the last time that Jesus’ words were not understood (check out Mark 9:30-32). It seems everyone is consumed with their own finite life, including the current construction projects and cultural icons, but Jesus appears to be consistently dwelling on his death and the sacrifice that would be required in order to reconcile us back to Him. A Creator Himself, He may well have appreciated the craftsmanship of the building and its beauty. The Temple had long been a house for God, but Jesus knew that for all its lofty architecture it would not stand the test of time (it was destroyed again in 70 AD). Alas, something infinitely more impressive was in their presence, but went unrecognized. The Temple had clearly become less a place of worship and more an icon of identity. Today marks the 160th anniversary of the first World’s Fair. It was the during the 1939 World’s Fair in New York City, 72 years ago, that the “world trade center” pavilion was first dedicated to “world peace through trade” paving the way for the Twin Towers which were finished in 1970 and 1971. While a nice slogan, global trade in a capitalist market has not accomplished world peace but in many respects has contributed to further oppression of the world’s most vulnerable peoples. 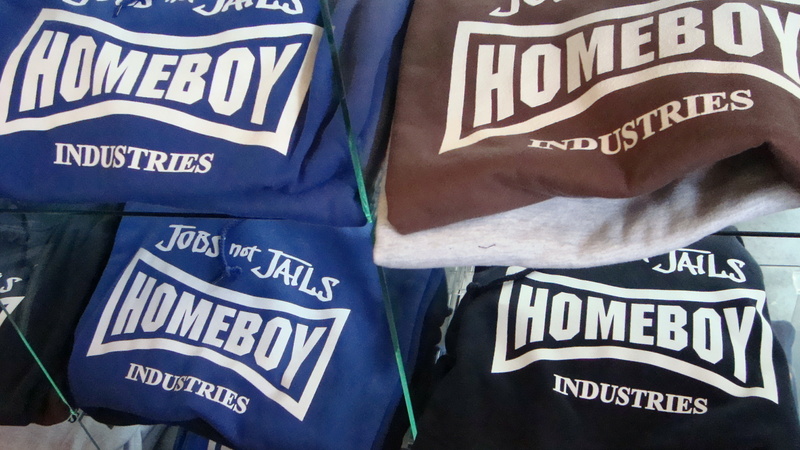 Whenever we seek glory for ourselves in place of contributing to God’s design of shalom, we are bound for eventual destruction, regardless of how much prismatic glass or pristine limestone on our façade. This was the lesson of another famous skyscraper, The Tower of Babel, in Genesis 11. With a common language and purpose, mankind had set out to “make a name for ourselves” and laid plans for a “tower with its top in the sky.” Perhaps Jesus remembered the Tower of Babel when he looked at what the Temple had become, and certainly the continual rising of towers in New York warrants our reconsideration of the story. Will O’Brien of the Alternative Seminary in Philadelphia points out that the Tower of Babel was likely a ziggurat with a wide base structure that ascended in smaller bases until a pyramid-like point was reached. The ziggurat’s pyramid structure is also symbolic of the typical human power structure in which the wide base of society is made up of the powerless supporting a small point of elite and the ruling class. The ziggurat, much like our current skyscrapers and other famous phallic symbols was a structure constructed to attract awe. O’Brien also notes that the Tower of Babel story can be viewed as an anti-imperial text. The phrase “make a name” indicates mankind was interested in creating their own glory. As such, God came down and thwarted the effort. In contrast, Acts 2 presents an alternative power structure in which the architecture of the Tower is reversed and instead the Holy Spirit descends from above and then disperses equally among the wide base of the people, the symbolically and traditionally powerless, led by uneducated fisherman with the equivalent of a thick Southern drawl. O’Brien suggests that the Holy Spirit, which Christ came to send, is literally the inverse of imperialism and Empire building. It is at Pentecost in Acts 2 that we see the dawn of God’s church, where language and communication is restored not confused, and people are reunited not scattered. 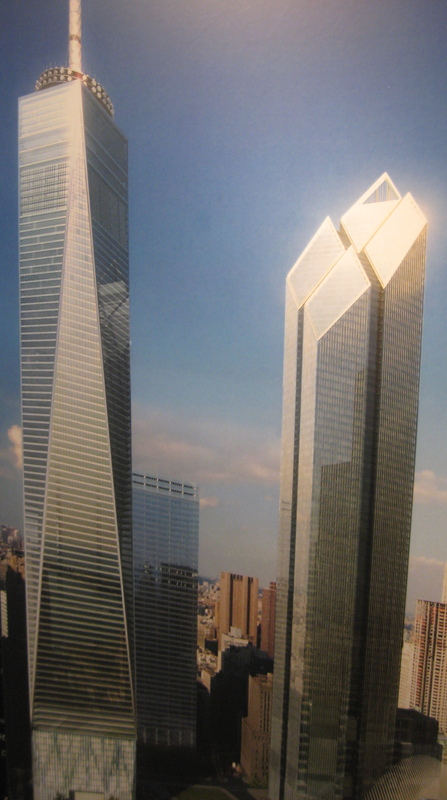 There is no denying that the new World Trade Center will be impressive from man’s vantage point. The National September 11 Memorial & Museum was thoughtfully designed and will powerfully remember all those who were lost. But perhaps we as the church would do well to remember our Builder and set the rising structures of awe aside. To dwell in the true beauty found among the poor in spirit and the mourners. To recognize that true power is witnessed in the resurrected Christ.